Can Theravada Buddhism save the world? Why not? It is certainly a fount of wisdom. However, one grad student is more concerned with the advanced meditation skills it teaches. 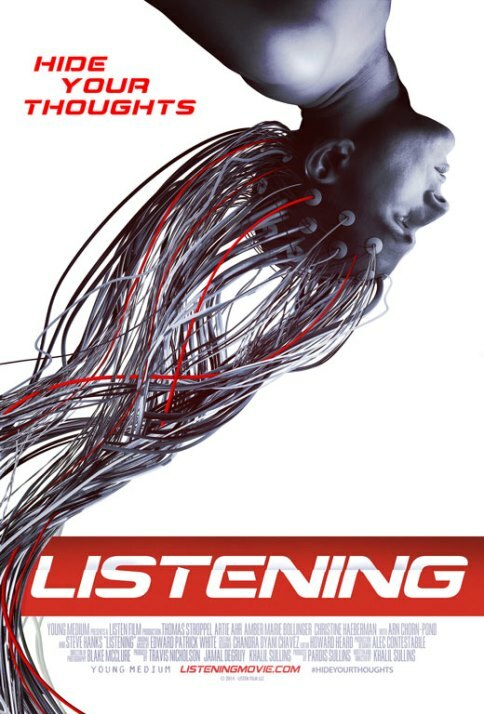 Controlling one’s thoughts will be one of the gravest challenges of the Brave New World he helps bring about in screenwriter-director Khalil Sullins’ Listening (trailer here), which opens tomorrow in New York. David Thorogood and his hound dogging grad school buddy Ryan Cates are on the brink of a major breakthrough in mental telepathy. They can transfer mental images to a hard drive, but the decryption rate makes applications impractical thus far. Much to the married Thorogood’s surprise, Cates’ latest would be conquest, Jordan Rose, provides the outside perspective they need. Suddenly, they are going wireless, sending thoughts directly from one noggin to another. Unfortunately, the sender does not have much control over what the receiver gets. This becomes especially awkward when Rose starts destabilizing the team in a two’s-company-three’s-a-crowd kind of way. To make matters more ominous, the mean old CIA has also been tracking their progress. Listening is a frustrating film, because it starts with a promising premise, but never fully develops it. The notion ancient Buddhist teachings could undermine dystopian cyberpunk technology is wildly cool, but Sullins only uses it as an intriguing in media res prologue, never really exploring it to any meaningful extent. Similarly, casting the CIA as the villains is a lazy cliché that denigrates the service of hundreds of agents who gave their lives for our country. Frankly, Sullins constantly takes a C-student approach, doing just enough to get by. A case in point is the conspicuously underwhelming “meh” climax. It is not wildly helpful either that Thomas Stroppel’s lead performance essentially consists of varying shades of sullenness. At least Artie Ahr and Amber Marie Bollinger provide some much needed energy as Cates and Rose, respectively. The latter also manages to carry off the Natalie Dormer Hunger Games hairstyle, which is impressive in its way. There are seeds of something sprinkled throughout Listening, but they are never adequately cultivated. It also looks rather drab and pedestrian. Disappointing for its lack of ambition, Listening opens tomorrow (9/11) in New York, at the Village East.